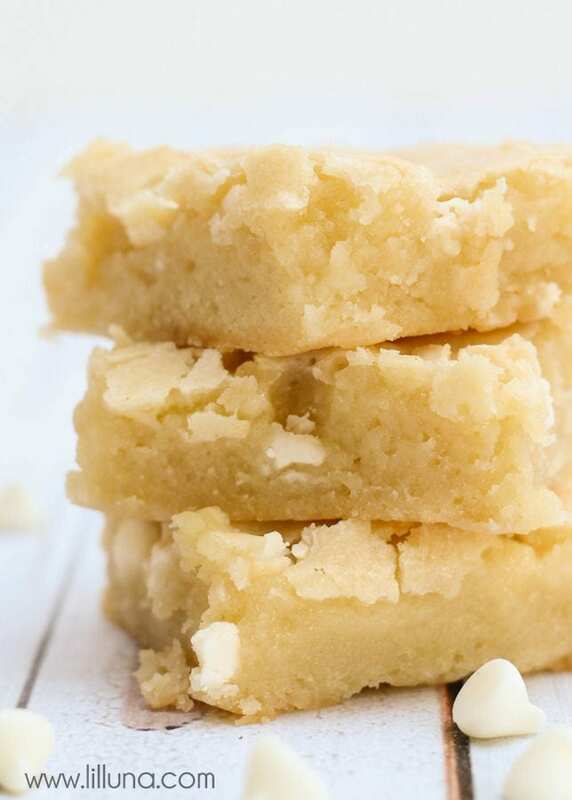 Today, I’m sharing another recipe for you – White Chocolate Blondies. 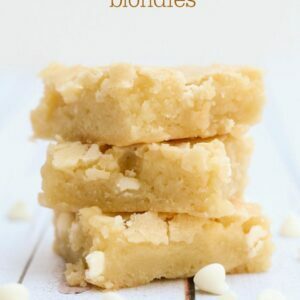 I’ve mentioned before my love for white chocolate (yes, I like it more so than milk chocolate) so you could guess I prefer blondies over brownies (no worries – I still like brownies too!!) 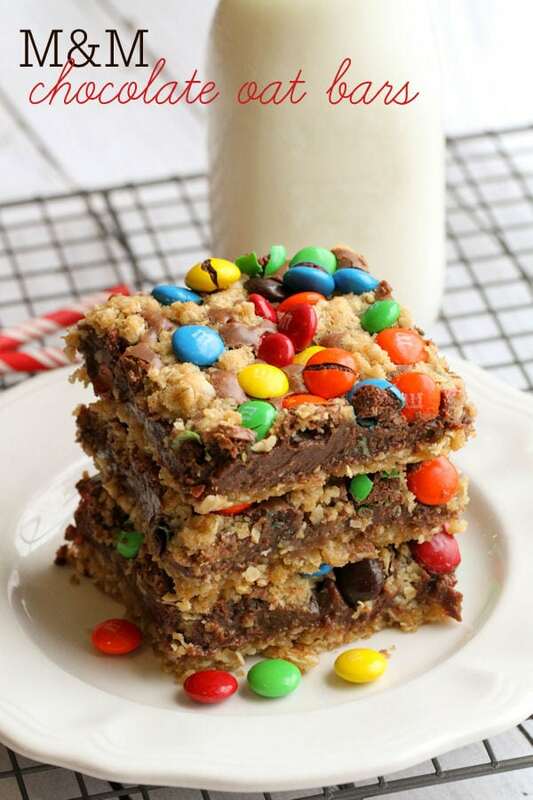 I know there are some of you like me out there so if you are a fan of blondies and would like to try a new recipe for them, then this is the one. It’s an easy recipe and other than the white chips, I’m sure you have all the ingredients on hand. 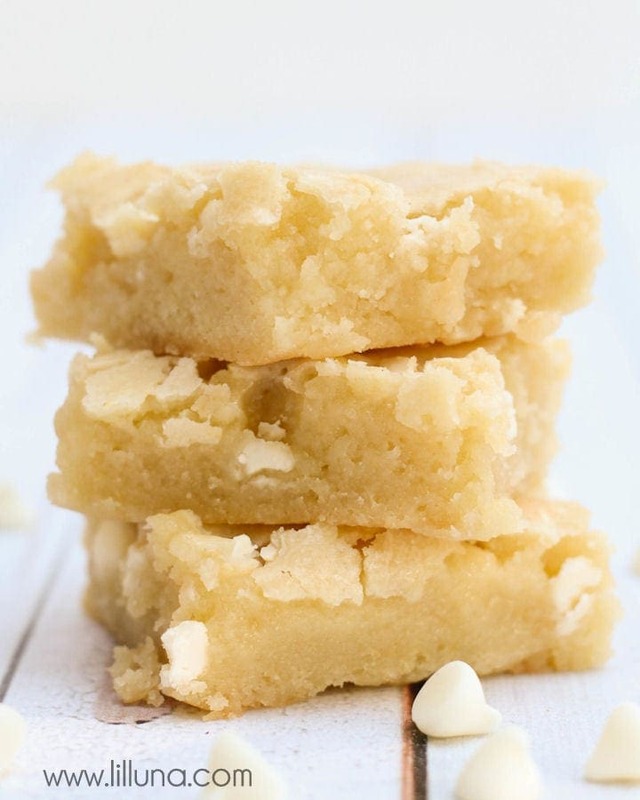 Super gooey and delicious White Chocolate Blondies. A vanilla brownie with white chocolate chips. Beat eggs, sugar and vanilla extract in a medium bowl. Mix in the cooled butter and chocolate mixture along with the flour and salt. Stir until combined. 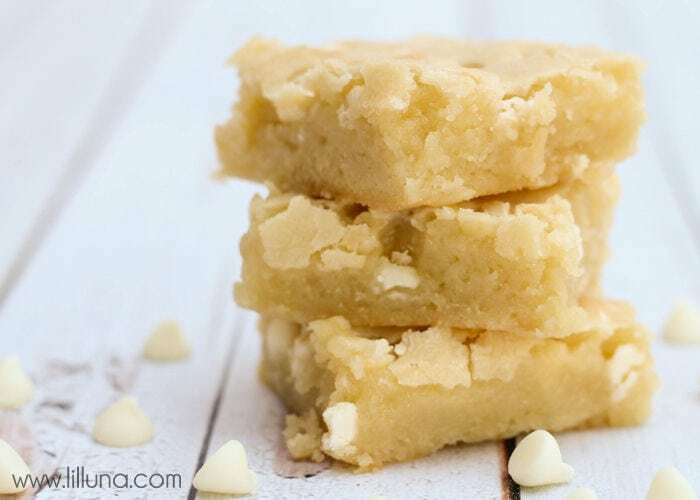 Pour the batter into a 9x13 greased baking pan; sprinkle with the remaining 1 cup white chocolate chips. Bake at 350 for 30-35 minutes, until a toothpick comes out clean. Allow to cool in pan for at least 10 minutes before cutting. I love how those blonde they are and how yummy they look. What font have you used for ‘white chocolate’? I’d love to add it to my collection. I co-host Sweet and Savoury Sunday and would love for you to stop by and share this and other recipes with us. Have a great day! So simple and sooo delicious! I will have to make this recipe soon! Oh yum! These look so good. I love me a good dessert!! Thanks, Crystal… I admit, I’m pretty obsessed with white chocolate. It’s mine and the hubby’s favorite! 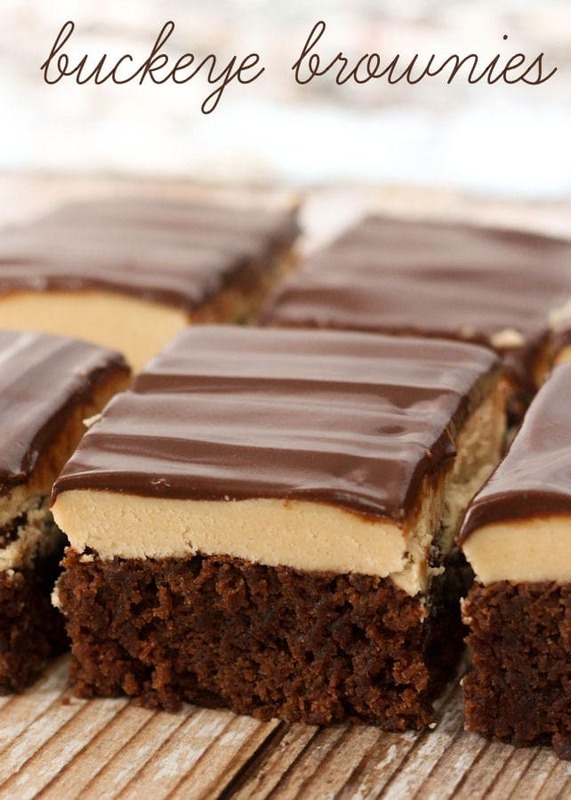 Another awesome recipe… You are killing me girl! I just made these they are AMAZING!!! I just recently realized that I LOVE white chocolate way more than any other kind of chocolate! My 5 year old son and I had a blast making these! Mmm! Just made these and they smell wonderful! I can’t wait for them to chill! I added macadamias, since that’s what I was craving. I loved them! Great texture and very chocolatey! My macadamia stash is depleted, but totally with it. 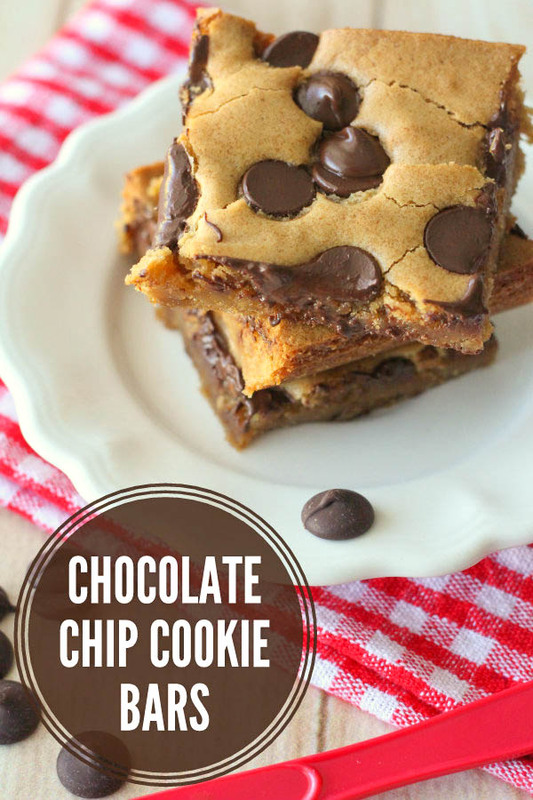 I made these the other night and they are dangerously delicious. I just had to share them with my friends and they absolutely loved them. Great recipe! 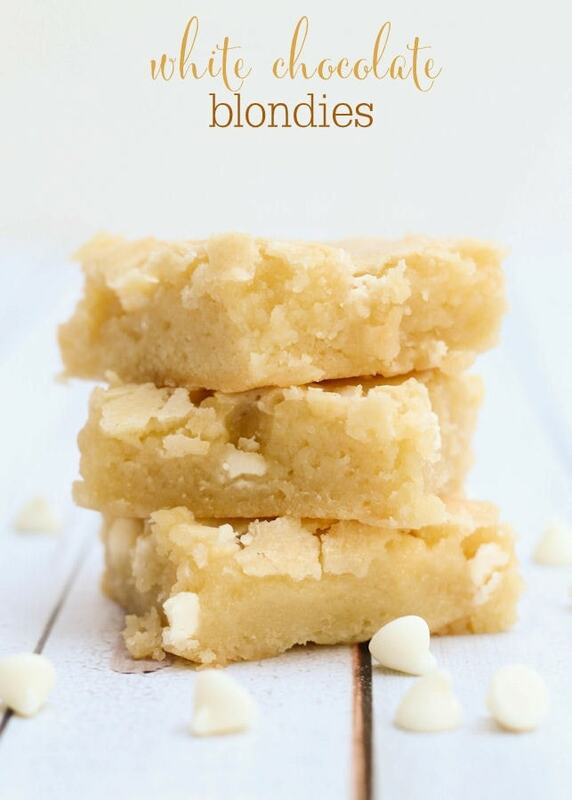 I’m so happy you liked them – we are obsessed with blondies in our family. 😉 Thanks for stopping by!! I wondered about how many brownies this recipe makes? I can’t wait to try it tonight! This is just an incredible recipe! Unbelievably delicious! Thank you so much, Wendy!! We sure love blondies at our home! Glad you liked them! Haha!! It sure is hard to wait!! Thanks for trying this recipe and letting me know!! How should I store these? Im baking them tonight to take to work tomorrow. Just leave out at work temp or stick them in the fridge? Also, could i make them in a cupcake tin? Sorry, to not get back to you sooner. How did they turn out? They are fine out on the counter. I have never tried them in a cupcake tin. Did you try that? I left them out on the counter and they did just fine. I did end up using the cupcake tin but I think I should add more melted butter and white chocolate next time. They were more cake like than fudgy. I’m glad they turned out! Thanks for letting me know! Actually taking a sec to comment for anyone trying to decide… I really enjoyed these, but brought them to a Christmas party last year and people STILL rave, hound me for the recipe, and ask me to make them again… wouldn’t have expected it since I usually go for a more dark/milk chocoholic loaded mess, but by far the most popular recipe I’ve ever made. Thanks!! Awe, I am so happy to hear that!!! They are usually gone within minutes around here! White chocolate is my fav! Thank you so much for letting me know! I made these last night. I cooked them for the specified time and the center was still VERY gooey. I put them back in for another 20 min and still very gooey in the center. What did I do wrong? Hmm..not sure?? I know all ovens are different, but that seems like a lot of extra time. I’m sorry, I wish I knew. Maybe next time, adjust the temp and just keep an eye on it? Thank you for trying them, though! How many blondies does the recipe make? It could make anywhere from 12 bigger ones to 16 to a little more, depending on how big you cut them. Hope that helps! They are seriously so good! Yummm I can’t stop making these not to mention eating them!! A favourite in our house gone before you can say blondie! ❤️???? Yay..love to hear that! And, I agree..gone way too fast! First off, virtual fist bump!! These are so freaking delicious! Dangerously so. I reduced the sugar by 1/2 cup and added more white chocolate. I used this recipe to make cupcakes and drizzled more white chocolate on top. I will never make another brownie again. I’m officially sold on your blondies! Woohoo!!! Thank you so much!! White chocolate is my favorite!! I am so glad you like them, as much as I do!! Tried these with granulated no calorie stevia… Did not come out good. Not sure if that us why or if I did something else wrong. Anyone else try to make with stevia and they turn out good? I personally haven’t tried, so I am not sure the outcome? I will have to try 🙂 Thanks! Oh, I am sorry. All ovens are different, so baking times will vary. Thank you for trying them! I made these yesterday to take to a NYW party. They were a HIT! Way better than I expected (I’m a milk chocolate gal;), and a friend said they were “decadent”. You are so welcome! Thank you for trying them! I am glad they were a hit! Yum!!! I am so glad you liked them! Adding the hershey’s would be a great addition! Thank you!